The 2016 Democratic Party presidential primaries and caucuses were a series of electoral contests organized by the Democratic Party to select the 4,051 delegates to the Democratic National Convention held July 25–28 and determine the nominee for President of the United States in the 2016 U.S. presidential election. The elections took place within all fifty U.S. states, the District of Columbia, and five U.S. territories and occurred between February 1 and June 14, 2016. A total of six major candidates entered the race starting April 12, 2015, when former Secretary of State and New York Senator Hillary Clinton formally announced her second bid for the presidency. She was followed by Vermont Senator Bernie Sanders, former Governor of Maryland Martin O'Malley, former Governor of Rhode Island Lincoln Chafee, former Virginia Senator Jim Webb and Harvard Law Professor Lawrence Lessig. A draft movement was started to encourage Massachusetts Senator Elizabeth Warren to seek the presidency, but Warren declined to run, as did incumbent Vice President Joe Biden. Webb, Chafee, and Lessig withdrew prior to the February 1, 2016, Iowa caucuses. Clinton won Iowa by the closest margin in the history of the state's Democratic caucus. O'Malley suspended[b] his campaign after a distant third-place finish, leaving Clinton and Sanders the only two candidates. The race turned out to be more competitive than expected, with Sanders decisively winning New Hampshire, while Clinton subsequently won Nevada and won a landslide victory in South Carolina. Clinton then secured numerous important wins in each of the nine most populous states including California, New York, Florida, and Texas, while Sanders scored various victories in between. He then laid off a majority of staff after the New York primary and Clinton's multi-state sweep on April 26. On June 6, the Associated Press and NBC News stated that Clinton had become the presumptive nominee after reaching the required number of delegates, including both pledged and unpledged delegates (superdelegates), to secure the nomination. In doing so, she became the first woman to ever be the presumptive nominee of any major political party in the United States. On June 7, Clinton officially secured a majority of pledged delegates after winning in the California and New Jersey primaries. President Barack Obama, Vice President Joe Biden and Senator Elizabeth Warren formally endorsed Clinton on June 9. Sanders confirmed on June 24 that he would vote for Clinton over Donald Trump in the general election and formally endorsed Clinton on July 12 in Portsmouth, New Hampshire. On July 22, WikiLeaks published the Democratic National Committee email leak, in which DNC operatives seemed to deride Bernie Sanders' campaign and discuss ways to advance Clinton's nomination. While the leak was part of an alleged operation by the Russian government to undermine Hillary Clinton, it cast doubt on the DNC's neutrality and, according to Sanders operatives and multiple media commentators, portrayed an organization invested in promoting the Clinton candidacy and sabotaging that of Bernie Sanders. The debate schedule had already been criticized as far back as 2015, including by aspiring candidate Martin O'Malley, as biased in Clinton's favor. Democratic Party Chairwoman Donna Brazile, who succeeded Debbie Wasserman Schultz as DNC chair after the first batch of leaks, was shown in the emails leaking primary debate questions to the Clinton campaign before the debates were held. Brazile later went on to write a book about the primary and what she called 'unethical' behavior by the Clinton campaign and the DNC during it. Other media commentators have argued that, while the DNC's actions could have affected the race, those actions and their internal preference for Clinton were unlikely to have swayed the outcome. On July 26, 2016, the Democratic National Convention officially nominated Clinton for president and Virginia Senator Tim Kaine for vice president. On November 8, 2016, Republican nominee Donald Trump defeated Clinton in the general election by winning a majority of votes in the Electoral College, despite losing the popular vote to Clinton by nearly three million votes. The following candidates were frequently interviewed by news channels and were invited to forums and candidate debates. For reference, Clinton received 16,849,779 votes in the primaries. Other candidates participated in one or more state primaries without receiving major coverage or, with the exception of Rocky de la Fuente, substantial vote counts. In the weeks following the re-election of President Obama in the 2012 election, media speculation regarding potential candidates for the Democratic presidential nomination in the 2016 presidential election began to circulate. The speculation centered on the prospects of Clinton, then-Secretary of State, making a second presidential bid in the 2016 election. Clinton had previously served as a U.S. Senator for New York (2001–09) and was the First Lady of the U.S. (1993–2001). A January 2013 Washington Post–ABC News poll indicated that she had high popularity among the American public. This polling information prompted numerous political pundits and observers to anticipate that Clinton would mount a second presidential bid in 2016, entering the race as the early front-runner for the Democratic nomination. From the party's liberal left wing came calls for a more progressive candidate to challenge what was perceived by many within this segment as the party's establishment. Elizabeth Warren quickly became a highly touted figure within this movement as well as the object of a draft movement to run in the primaries, despite her repeated denials of interest in doing so. The MoveOn.org campaign 'Run Warren Run' announced that it would disband on June 8, 2015, opting to focus its efforts toward progressive issues. The draft campaign's New Hampshire staffer, Kurt Ehrenberg, had joined Sanders' team and most of the remaining staffers were expected to follow suit. Given the historical tendency for sitting vice presidents to seek the presidency in election cycles in which the incumbent president is not a candidate, there was also considerable speculation regarding a potential presidential run by incumbent Vice President Joe Biden, who had previously campaigned for the Democratic presidential nomination in the election cycles of 1988 and 2008. This speculation was further fueled by Biden's own expressions of interest in a possible run in 2016. However, on October 21, 2015, speaking from a podium in the Rose Garden with his wife and President Obama by his side, Biden announced his decision not to enter the race, as he was still dealing with the loss of his son, Beau, who died weeks earlier at the age of 47. On May 26, 2015, Sanders officially announced his run as a presidential candidate for the Democratic nomination, after an informal announcement on April 30 and speculation since early 2014. Sanders has previously served as Mayor of Burlington, Vermont (1981–89), Vermont's sole U.S. Representative (1991–2007) and Vermont's junior Senator (2007–present). He emerged as the biggest rival to Hillary Clinton in the Democratic primaries, backed by a strong grassroots campaign and a social media following. In November 2014, Jim Webb, a former U.S. Senator who had once served as the U.S. Secretary of the Navy during the Reagan administration, announced the formation of an exploratory committee in preparation for a possible run for the Democratic presidential nomination. This made Webb the first major potential candidate to take a formal action toward seeking the party's 2016 nomination. Martin O'Malley, former Governor of Maryland as well as a former Mayor of Baltimore, made formal steps toward a campaign for the party's nomination in January 2015 with the hiring and retaining of personnel who had served the previous year as political operatives in Iowa – the first presidential nominating state in the primary elections cycle – as staff for his political action committee (PAC). O'Malley had started the "O’ Say Can You See" PAC in 2012 which had, prior to 2015, functioned primarily as fundraising vehicles for various Democratic candidates, as well as for two 2014 ballot measures in Maryland. With the 2015 staffing moves, the PAC ostensibly became a vehicle for O'Malley – who had for several months openly contemplated a presidential bid – to lay the groundwork for a potential campaign for the party's presidential nomination. In August 2015, Lawrence Lessig unexpectedly announced his intention to enter the race, promising to run if his exploratory committee raised $1 million by Labor Day. After accomplishing this, Lessig formally announced his campaign. He described his candidacy as a referendum on electoral reform legislation, prioritizing a single issue: the Citizen Equality Act of 2017, a proposal that couples campaign finance reform with other laws aimed at curbing gerrymandering and ensuring voting access. Despite being heavily favored in polls issued weeks earlier, Clinton was only able to defeat Sanders in the first-in-the-nation Iowa Caucus by the closest margin in the history of the contest: 49.8% to 49.6% (Clinton collected 700.47 state delegate equivalents to Sanders' 696.92, a difference of one quarter of a percentage point). The victory, which was projected to award her 23 pledged national convention delegates (two more than Sanders), made Clinton the first woman to win the Caucus and marked a clear difference from 2008, where she finished in third place behind Obama and John Edwards. Martin O'Malley suspended[b] his campaign after a disappointing third-place finish with only 0.5% of the state delegate equivalents awarded, leaving Clinton and Sanders the only two major candidates in the race. A week later, Sanders won the New Hampshire primary, receiving 60.4% of the popular vote to Clinton's 38%, putting him ahead of Clinton in the overall pledged delegate count by four, and making him the first Jewish candidate of a major party to win a primary. Hillary Clinton's loss in New Hampshire was a regression from 2008, when she defeated Obama, Edwards, and a handful of other candidates including Joe Biden with 39% of the popular vote. Sanders' narrow loss in Iowa and convincing victory in New Hampshire generated speculation about a possible loss for Clinton in Nevada, the next state to hold its caucuses on February 20. For her part, Clinton, who had won the state eight years prior in the 2008 Nevada Democratic caucuses, hoped that a victory would allay concerns about a possible repetition of 2008, when she ultimately lost to Obama despite entering the primary season as the favorite for the nomination. Ultimately, Clinton emerged victorious with 52.6% of the county delegates, a margin of victory similar to her performance in 2008. Sanders, who attained 47.3% of the vote, was projected to receive five fewer pledged delegates than Clinton and the result was not promising for the following weekend's primary in South Carolina, more demographically favorable to Clinton than the prior contests. On February 27, Clinton won the South Carolina primary with 73.5% of the vote, receiving a larger percentage of the African American vote than Barack Obama had eight years earlier – 90% to Obama's 80%. The 2016 primary schedule was significantly different from that of 2008. During that election cycle, many states moved their primaries or caucuses to earlier in the calendar to have greater influence over the race. In 2008, February 5 was the earliest date allowed by the Democratic National Committee, leading 23 states and territories to move their elections to that date, the biggest Super Tuesday to ever take place. For 2016, the calendar was more disparate than it was in 2008, with several groups of states voting on different dates, the most important being March 1, March 15, April 26 and June 7. The day with the most contests was March 1, 2016, in which primaries or caucuses were held in 11 states (including six in the Southern United States) and American Samoa. A total of 865 pledged delegates were at stake. Clinton secured victories in all of the southern contests except Oklahoma. Her biggest victory of the day came in Alabama, where she won 77.8% of the vote against Sanders' 19.2%, although her most significant delegate prize came from Texas, where she received 65.2% of the vote with strong support from non-white as well as white voters. Collectively, the southern states gave Clinton a net gain of 165 pledged delegates. Apart from the South, Clinton also narrowly defeated Sanders in Massachusetts, as well as winning in the territory of American Samoa. Sanders scored comfortable wins in the Minnesota and Colorado caucuses and Oklahoma primary and won an 86.1%–13.6% landslide in his home state of Vermont - one of only two times either of the two main candidates missed the 15% threshold in a state or territory, with the U.S. Virgin Islands, where Clinton received over 87% of the vote, being the other one. Although the results overall were unfavorable for Sanders, his four wins and narrow loss allowed him to remain in the race in anticipation of more favorable territory in New England, the Great Plains, Mountain States and the Pacific Northwest. At the end of the day, Clinton collected 518 pledged delegates to Sanders' 347, taking her lead to roughly 200 pledged delegates. Sanders found more hospitable ground on the weekend of March 5, 2016, winning caucuses in Kansas, Maine and Nebraska by significant margins. Clinton answered with an even larger win in Louisiana's primary, limiting Sanders' net gain for the weekend to only four delegates. Clinton would also win the Northern Mariana Islands caucus, held the following weekend on March 12. Two states had held nominating contests on March 8 – Michigan and Mississippi – with Clinton heavily favored to win both. Mississippi went for Clinton, as expected, by a landslide margin. The Mississippi primary was the highest vote share Clinton won in any state. However, Sanders stunned by scoring a narrow win in Michigan. Analysts floated a number of theories to explain the failure of the Michigan polling, with most centering on pollsters' erroneous assumptions about the composition of the electorate stemming from the 2008 primary in Michigan not having been contested due to an impasse between the state party and DNC. Although Clinton expanded her delegate lead, some journalists suggested Sanders' upset might presage her defeat in other delegate-rich Midwestern states, such as Missouri, Ohio and Illinois, who voted a week later on March 15, along with North Carolina and Florida, where Clinton was more clearly favored. Clinton was able to sweep all five primaries, extending her pledged delegate lead by around 100 delegates, although Sanders was able to hold Clinton to narrow margins in her birth-state of Illinois and especially Missouri, where Clinton won by a mere 0.2 points. Missouri state law allowed for a possible recount had any of the candidates requested it; however, Sanders forwent the opportunity on the basis that it would not significantly affect the delegate allocation. By the end of the evening, Clinton had expanded her pledged delegate lead to more than 320, several times larger than her greatest deficit in the 2008 primary. Following the March 15 primaries, the race moved to a series of contests more favorable for Sanders. On March 21, the results of the Democrats Abroad primary (held March 1–8) were announced. Sanders was victorious and picked up nine delegates to Clinton's four, closing his delegate deficit by five. Arizona, Idaho and Utah held primaries on March 22, dubbed "Western Tuesday" by media. Despite continued efforts by Sanders to close the gap in Arizona after his surprise win in Michigan, Clinton won the primary with 56.3% of the vote. However, Clinton lost both Idaho and Utah by roughly 60 points, allowing Sanders to close his delegate deficit by 25. The next states to vote were Alaska, Hawaii and Washington on March 26, 2016. All three states were considered as favorable for Sanders, and most political analysts expected him to win them all, given the demographics and Sanders' strong performance in previous caucuses. Sanders finished the day with a net gain of roughly 66 delegates over Clinton. His largest win was in Alaska, where he defeated Clinton with 82% of the vote, although the majority of his delegate gain came from the considerably more populous state of Washington, which he won by a 46% margin, outperforming then-Senator Obama's 2008 results, when he defeated Clinton 68%–31%. The Clinton and Sanders campaigns reached an agreement on April 4 for a ninth debate to take place on April 14 (five days before the New York primary) in Brooklyn, New York, which would air on CNN and NY1. On April 5, Sanders won the Wisconsin primary by 14 points, closing his delegate deficit by 10 more. The Wyoming caucuses were held on April 9, which Sanders won with 55.7% of the state convention delegates choosing him; however, Clinton had a stronger showing than expected, given her demographic disadvantage and that she did not campaign personally in the state. Each candidate was estimated to have earned 7 of Wyoming's 14 pledged delegates. On April 19, Clinton won New York by 16 points. While Sanders performed well in Upstate New York and with younger voters, Clinton performed well among all other age groups and non-whites, and she won a majority in all boroughs of New York City. Five Northeastern states held primaries a week later on April 26. The day was dubbed the "Super Tuesday III" or the "Acela Primary" after Amtrak's Acela Express train service that connects these states. Clinton won in Delaware, Maryland, Pennsylvania and Connecticut while Sanders won the Rhode Island primary. On May 3, Sanders pulled off a surprise victory in the Indiana primary, winning over Clinton by a five-point margin despite trailing in all the state's polls. Clinton then won the Guam caucus on May 7 and, on May 10, she won the non-binding Nebraska primary while Sanders won in West Virginia. Clinton narrowly won Kentucky on May 17 by half a percentage point and gained one delegate, after heavily campaigning in the state. On the same day, Sanders won his second closed primary in Oregon where he gained nine delegates, a net gain of eight on the day. Clinton then went on to win the non-binding Washington primary on May 24. June contained the final contests of the Democratic primaries, and both Sanders and Clinton invested heavily into winning the California primary. Clinton led the polls in California but some predicted a narrow race. On June 4 and 5, Clinton won two decisive victories in the Virgin Islands caucus and Puerto Rico primary. On June 6, both the Associated Press and NBC News reported that Clinton had sufficient support from pledged and unpledged delegates to become the presumptive Democratic nominee. Clinton's campaign seemed reluctant to accept the mantle of "presumptive nominee" before all the voting was concluded, while Sanders' campaign stated it would continue to run and accused the media of a "rush to judgement." Six states held their primaries on June 7. Clinton won in California, New Jersey, New Mexico and South Dakota. Sanders won Montana and North Dakota, the latter being the only caucus contest held on that day. Clinton finally declared victory on the evening of June 7, as the results ensured that she had won a majority of the pledged delegates and the popular vote. Sanders stated he would continue to run for the Democratic Party's nomination in the final primary in the District of Columbia on June 14, which Clinton won. Both campaigns met at a downtown Washington D.C. hotel after the primary. The Sanders campaign said that they would release a video statement on June 16 to clarify the future of Sanders' campaign; the video announced that Sanders looked forward to help Clinton defeat Trump. On July 12, 2016, Sanders endorsed Clinton in Portsmouth, New Hampshire. On July 22, 2016, WikiLeaks released online tens of thousands of messages hacked from the e-mail accounts of seven key DNC staff. Some e-mails showed two DNC staffers discussing the possibility that Sanders' possible atheism might harm him in a general election with religious voters. Others showed a few staffers had expressed personal preferences that Clinton should become the nominee, suggesting that the party's leadership had worked to undermine Bernie Sanders' presidential campaign. Then-DNC chair Debbie Wasserman Schultz called the accusations lies. The furor raised over this matter escalated to Wasserman Schultz's resignation ahead of the convention, and that of Marshals, Dacey, and Communications Director Luis Miranda afterwards. Following Wasserman Schultz's resignation, then-DNC Vice Chair Donna Brazile took over as interim DNC chairwoman for the convention and remained so until February 2017. In November 2017, Brazile said in her book and related interviews that the Clinton campaign and the DNC had colluded 'unethically' by giving the Clinton campaign control over the DNC's personnel and press releases before the primary in return for funding, in addition to using the DNC and state committees to funnel campaign-limitation-exceeding donations to her campaign. Internal memos later surfaced, claiming that these measures were not meant to affect the nominating process despite their timing. At the end of June 2016, it was claimed that "more money [from the Hillary Victory Fund] will be moved to the state parties in the coming months." Brazile later clarified that she claimed the process was 'unethical', but 'not a criminal act'. After the general election, the U.S. intelligence community and the Special Counsel investigation assessed that the leaks were part of a larger interference campaign by the Russian government to cause political instability in the United States and to damage the Hillary Clinton campaign by bolstering the candidacies of Donald Trump, Bernie Sanders, and Jill Stein. The Russian government is alleged to have promoted Sanders beginning in 2015 as a way to weaken or defeat Clinton, who Russian President Vladimir Putin opposed. The influence campaign by the Internet Research Agency targeted Sanders voters through social media and encouraged them to vote for a third party candidate or abstain from voting. Sanders denounced these efforts and urged his supporters to support Clinton in the general election. When news of the DNC hack first surfaced in June 2016, the Russian government denied allegations of any involvement. WikiLeaks founder Julian Assange also stated that the Russian government was not source of the leak. In July 2018, the special counsel indicted 12 Russian intelligence officers for hacking and leaking the emails. The 2016 Democratic National Convention was held from July 25–28 at the Wells Fargo Center in Philadelphia, with some events at the Pennsylvania Convention Center. The delegates selected the Democratic presidential and vice presidential nominees and wrote the party platform. A simple majority of 2,383 delegates was needed to win the presidential nomination. While most of the delegates were bound on the first ballot according to the results of the primaries, a progressively larger number of pledged delegates would have become unbound if the nomination required more than one ballot. Clinton was nominated on the first ballot by acclamation, although all states were allowed to announce how they would have voted under a typical roll call vote. On July 12, 2016, the Vermont delegates had supported Clinton in Sanders' request; asking for party unity, he dropped out on July 26, 2016 and announced he would return to the Senate as an independent. This is an overview of the money used in the campaign as it is reported to Federal Election Commission (FEC) and released on April 27, 2016. 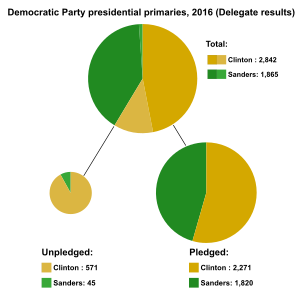 Outside groups are independent expenditure only committees—also called PACs and SuperPACs. Several such groups normally support each candidate, but the numbers in the table are a total of all of them. This means that a group of committees can be shown as technically insolvent (shown in red) even though it is not the case of all of them. The Campaign Committee's debt are shown in red if the campaign is technically insolvent. The source of all the numbers is Center for Responsive Politics. Some spending totals are not available, due to withdrawals before the FEC deadline. 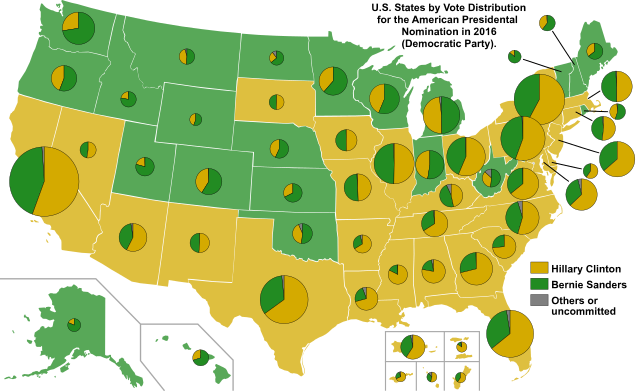 The number of electoral votes each state has in the United States Electoral College. The stage of the primary season when they held their contest. States and territories that held their contests later are given bonus seats. A candidate must win 2,383 delegates at the national convention, in order to win the 2016 Democratic presidential nomination. For the U.S. territories of Puerto Rico, American Samoa, Guam, the U.S. Virgin Islands and for Democrats Abroad, fixed numbers of pledged delegates are allocated. 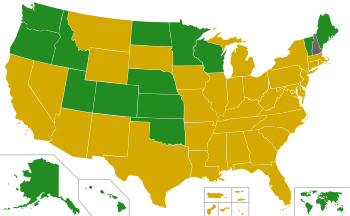 All states and territories then must have used a proportional representation system, where their pledged delegates were awarded proportionally to the election results. A candidate must receive at least 15% of the popular vote to win pledged delegates in a state. The current 714 unpledged superdelegates (or "soft" delegates) will include members of the United States House of Representatives and Senate, state and territorial governors, members of the Democratic National Committee, and other party leaders. Because of possible deaths, resignations, or the results of intervening or special elections, the final number of these superdelegates may be reduced before the convention. The Democratic National Committee also imposed rules for states that wished to hold early contests in 2016. No state was be permitted to hold a primary or caucus in January and only Iowa, New Hampshire, South Carolina and Nevada were entitled to February contests. Any state that violated these rules were penalized half its pledged delegates and all its superdelegates to the 2016 convention. The following are the results of candidates that won at least one state. These candidates were on the ballots for every state, territory and federal district contest. The results of caucuses did not always have attached preference polls and attendance was extremely limited. The unpledged delegate count did not always reflect the latest declared preferences. May 10 Nebraska N/A Closed primary 42,692 (53.1%) 37,744 (46.9%) Non-binding primary with no delegates allocated. May 24 Washington N/A Open primary[l] 420,461 (52.4%) 382,293 (47.6%) Non-binding primary with no delegates allocated. Superdelegates are elected officials and members of the Democratic National Committee who will vote at the Democratic National Convention for their preferred candidate. Also known as unpledged delegates, they comprise 15% of the convention (712 votes out of 4,763) and they may change their preference at any time. The table below reflects current public endorsements of candidates by superdelegates, as detailed and sourced in the full list above. Because commonly referenced estimates of superdelegate support, including those by CNN and the AP, do not identify individual delegates as supporting a given candidate, their published tallies may differ from the totals computed here. ^ a b c In US elections, suspending a campaign allows candidates to cease active campaigning while still legally raising funds to pay off their debts. ^ a b According to popular vote or pledged delegate count (not counting superdelegates); see below for detail. ^ a b Pledged delegates split evenly between Sanders and Clinton. ^ Hillary Clinton won the non-binding Nebraska Democratic Primary. ^ Hillary Clinton won the non-binding Washington Democratic Primary. Open: Anyone can participate regardless of their registered party affiliation. Semi-open: Anyone can participate except registered Republicans. Semi-closed: Only registered Democrats or undeclared can participate. Closed: Only registered Democrats can participate. CD: 'Popular vote' tallies the county delegates. LDD: 'Popular vote' tallies the legislative district delegates. SCD: 'Popular vote' tallies the state convention delegates. SDE: 'Popular vote' tallies the state delegate equivalents. ^ Pledged delegates are elected with the understanding that they will support a specific candidate. Unpledged delegates (superdelegates) are not required to voice support for a specific candidate. ^ a b c d e One Illinois superdelegate is still committed to O'Malley. Therefore, the total number of available delegates is one less than expected. ^ There are 8 unpledged delegates from Democrats Abroad that each cast half a vote at the national convention. ^ Open to all voters excluding those who caucused with the Republicans on February 20. ^ Open to all voters, though those who attend must state they will identify as a Democrat for the 2016 election. ^ a b Berg-Andersson, Richard E. "Democratic Convention". The Green Papers. Retrieved June 13, 2016. ^ Reston, Laura (October 14, 2015). "Americans Love an Underdog—Just Not Lincoln Chafee, Jim Webb, or Martin O'Malley". New Republic. Retrieved June 2, 2016. ^ "Sanders Lays Off Staff After Tuesday Primary Losses". NBC News. Retrieved April 29, 2016. ^ "Hillary Clinton secures majority of pledged delegate". Politico. June 8, 2016. Retrieved June 15, 2016. ^ Eric Bradner. "Obama endorses Hillary Clinton in video". CNN. Retrieved June 10, 2016. ^ Bixby, Scott (June 9, 2016). "Hillary Clinton gets endorsements from Obama, Biden and Elizabeth Warren – as it happened". The Guardian. Retrieved June 15, 2016. ^ "US Election: Bernie Sanders says he will vote for Hillary Clinton". ABC News. Reuters. June 24, 2016. Retrieved June 24, 2016. ^ Keith, Tamara (July 11, 2016). "Sanders And Clinton To Rally Together In New Hampshire". npr.org. Retrieved July 12, 2016. ^ "Released Emails Suggest the D.N.C. Derided the Sanders Campaign". Retrieved November 6, 2018. ^ Blake, Aaron (July 25, 2016). "Here are the latest, most damaging things in the DNC's leaked emails". The Washington Post. Retrieved November 6, 2018. ^ a b "Elizabeth Warren agrees Democratic race 'rigged' for Clinton". BBC News. November 3, 2017. Retrieved November 21, 2018. ^ Schleifer, Theodore (July 25, 2016). "What was in the DNC email leak?". CNN. Retrieved November 21, 2018. ^ Chan, Melissa (July 24, 2016). "Bernie Sanders Calls for Debbie Wasserman Schultz to Resign After Email Leak". Time. Retrieved November 21, 2018. ^ Yuhas, Alan (July 24, 2016). "Hillary Clinton campaign blames leaked DNC emails about Sanders on Russia". The Guardian. Retrieved November 21, 2018. ^ Flaherty, Anne (July 24, 2016). "Sanders Calls for DNC Chair's Resignation as Hacked Emails Overshadow Convention". Haaretz. Retrieved November 21, 2018. ^ "Democratic primary debate schedule criticized as Clinton 'coronation'". The Guardian. August 6, 2015. ^ Caputo, Marc (July 24, 2016). "Wasserman Schultz steps down as DNC chair". Politico. Retrieved November 21, 2018. ^ "www.latimes.com/nation/politics/trailguide/la-na-trailguide-updates-former-senior-aide-to-bernie-sanders-1476297181-htmlstory.html". :A Times. October 12, 2016. ^ a b Brazile, Donna (November 2, 2017). "Inside Hillary Clinton's Secret Takeover of the DNC". "Politico". Retrieved November 10, 2017. ^ Heersink, Boris (November 4, 2017). "No, the DNC didn’t 'rig' the Democratic primary for Hillary Clinton". Washington Post. Retrieved March 8, 2018. ^ Houle, Dana (July 25, 2016). "No, the DNC Didn’t Rig the Primary in Favor of Hillary". The New Republic. Retrieved March 8, 2018. ^ Holland, Joshua (July 29, 2016). "What the Leaked E-mails Do and Don’t Tell Us About the DNC and Bernie Sanders". The Nation. Retrieved March 8, 2018. ^ "Hillary Clinton breaks the glass ceiling". Politico. Retrieved September 24, 2016. ^ "Martin O'Malley on Twitter". twitter.com. Retrieved June 10, 2016. ^ Debenedetti, Gabriel (February 1, 2016). "Martin O'Malley suspends bid for the Democratic nomination". Politico. Retrieved February 1, 2015. ^ Foley, Elise (May 29, 2015). "Lincoln Chafee to announce presidential run on June 3". Politico. Retrieved October 23, 2015. ^ Catanese, David (July 2, 2015). "Jim Webb Announces For President". U.S. News & World Report. Retrieved July 2, 2015. ^ "Webb drops Democratic presidential bid, weighs possible independent run". Fox News. October 20, 2015. Retrieved January 1, 2016. ^ "Campaign Press Release: Larry Lessig Hits $1 Million Fundraising Benchmark, Plans to Announce His Campaign for President at Historic New Hampshire Site". Lessig2016.us. Archived from the original on October 2, 2015. Retrieved September 11, 2015. ^ Cohen, Jon (December 5, 2012). "Run Hillary Run! : Majority want a Clinton 2016 candidacy". The Washington Post. Retrieved March 7, 2015. ^ Steinhauser, Paul (December 10, 2012). "Clinton rides high poll numbers into private life (for now?)". CNN. Retrieved March 7, 2015. ^ Cohen, Jon; Blake, Aaron (January 23, 2013). "Hillary Clinton reaches new heights of political popularity". The Washington Post. Retrieved March 7, 2015. ^ Marlantes, Liz (December 10, 2012). "Are Republicans really 'incapable' of beating Hillary Clinton in 2016?". The Christian Science Monitor. Retrieved March 7, 2015. ^ Marlantes, Liz (December 5, 2012). "New polls fuel speculation about Hillary Clinton in 2016". The Christian Science Monitor. Retrieved March 7, 2015. ^ a b Bolton, Alexander (November 12, 2013). "Left wants challenger for Hillary Clinton". The Hill. Retrieved March 10, 2015. ^ Martin, Jonathan (September 29, 2013). "Populist Left Makes Warren Its Hot Ticket". The New York Times. Retrieved March 10, 2015. ^ "Elizabeth Warren: I'm Not Running For President". The Huffington Post. Associated Press. December 4, 2013. Retrieved March 10, 2015. ^ "Campaign To Draft Elizabeth Warren For President Comes To A Halt". The Huffington Post. Retrieved June 5, 2015. ^ "Sanders Eyes Run Warren Run's Network in Iowa". Time. Retrieved June 5, 2015. ^ Rudin, Ken (May 7, 2013). "Joe Biden Has History On His Side But Little Else If Hillary Clinton Runs". NPR. Retrieved March 10, 2015. ^ Hobratsch, Jonathan (March 17, 2014). "When Vice Presidents Run for President". The Huffington Post. Retrieved March 10, 2015. ^ a b Gaudiano, Nicole (January 22, 2013). "Will Joe Biden run for president in 2016?". USA Today. Retrieved March 10, 2015. ^ Rucker, Philip (May 2, 2013). "Biden ponders a 2016 bid, but a promotion to the top job seems to be a long shot". The Washington Post. Retrieved March 10, 2015. ^ Mason, Jeff (October 21, 2015). "Biden says he will not seek 2016 Democratic nomination". AOL. Retrieved October 21, 2015. ^ "Joe Biden Is Not Running For President In 2016". The Huffington Post. Retrieved October 21, 2015. ^ "Bernie Sanders formally launches run for president with attack on 'grotesque' level of inequality". The Guardian. Retrieved June 5, 2015. ^ "Bernie Sanders, Long-Serving Independent, Enters Presidential Race as a Democrat". The New York Times. May 1, 2015. ^ "Senator Bernie Sanders May Run in 2016 -- NYMag". Daily Intelligencer. ^ "The Socialist Senator". The New York Times. January 21, 2007. ^ "Challenging Hillary Clinton, Bernie Sanders Gains Momentum in Iowa". The New York Times. Retrieved June 5, 2015. ^ a b Lee, Kurtis (November 20, 2014). "Long shot Jim Webb launches exploratory committee for presidential bid". Los Angeles Times. Retrieved November 20, 2014. ^ Wagner, John (July 26, 2012). "O'Malley launches federal PAC as national profile rises". The Washington Post. Retrieved March 11, 2015. ^ Wagner, John (January 27, 2015). "O'Malley, with eye on 2016, retains two political operatives with Iowa experience". The Washington Post. Retrieved March 11, 2015. ^ "Harvard Professor Hits Million Dollar Benchmark for White House Bid". Associated Press. September 6, 2015. ^ Foran, Clare (August 11, 2015). "Why Exactly Is Lawrence Lessig Considering Running for President?". National Journal. Retrieved August 11, 2015. ^ Walker, Hayley (September 6, 2015). "Harvard Professor Larry Lessig Says He's Running for President". ABC News. Retrieved September 6, 2015. ^ Merica, Dan (August 11, 2015). "Harvard professor Lawrence Lessig is exploring a long shot presidential bid". CNN. Retrieved August 11, 2015. ^ "Larry Lessig Isn't Giving Up On His Presidential Campaign". The Atlantic. October 17, 2015. Retrieved December 5, 2015. ^ "Election 2016 - Iowa Democratic Presidential Caucus". RealClearPolitics. Retrieved March 28, 2016. ^ "All Precincts Reported: Clinton Defeats Sanders By Historically Small Margin". Des Moines, Iowa: WHO-TV. ^ "And the Winner of the Iowa Caucus Is: Hillary Clinton (Barely)". The Advocate. ISSN 0001-8996. ^ "Iowa Caucus Results". The New York Times. February 27, 2016. Retrieved February 28, 2016. ^ "Iowa Caucus 2016: Election Results". NBC News. ^ Taylor, Jessica (February 1, 2016). "Martin O'Malley Ends Presidential Bid". NPR. Retrieved February 1, 2016. ^ Gregory Krieg. "Sanders 1st Jewish candidate to win presidential primary". CNN. Retrieved June 10, 2016. ^ Haberman, Maggie (February 10, 2016). "New Hampshire Primary: Results and Analysis". The New York Times. Retrieved February 10, 2016. ^ "New Hampshire Primary Results". The New York Times. February 27, 2016. Retrieved February 28, 2016. ^ Barone, Michael (February 12, 2016). "New Hampshire Primary -- Republicans Looking Better for General". National Review. Retrieved March 28, 2016. ^ "What if Hillary Clinton Loses in Nevada?". The Washington Post. February 19, 2016. Retrieved March 28, 2016. ^ "Why Hillary Clinton should be worried about Nevada". The Washington Post. February 12, 2016. Retrieved March 28, 2016. ^ "With New Hampshire primary nigh, Hillary Clinton shifts focus to Nevada caucuses and beyond". Los Angeles Times. February 5, 2016. Retrieved March 28, 2016. ^ "Nevada Caucus Results". The New York Times. February 27, 2016. Retrieved February 28, 2016. ^ "Black Voters Boost Hillary Clinton to South Carolina Primary Win". ABC News. Retrieved March 18, 2016. ^ "Super Tuesday Results 2016". The New York Times. March 14, 2016. Retrieved April 6, 2016. ^ Seitz-Wald, Alex. "Super Tuesday: Hillary Clinton Hauls in Delegates But Bernie Sanders Fights On". NBC News. Retrieved March 28, 2016. ^ "Hillary Clinton's Got This". FiveThirtyEight. Retrieved March 28, 2016. ^ "2016 Primary Forecasts: Michigan Democratic primary". FiveThirtyEight. Retrieved March 29, 2016. ^ "2016 Primary Forecasts: Mississippi Democratic primary". FiveThirtyEight. Retrieved March 29, 2016. ^ "Sanders wins surprise, narrow victory in Michigan". The Washington Post. March 9, 2016. Retrieved March 29, 2016. ^ "Why were the polls in Michigan so wrong?". The Washington Post. March 9, 2016. Retrieved March 29, 2016. ^ "Why Did The Polls Fail To Predict Sanders' Win In Michigan?". NPR. March 9, 2016. Retrieved March 29, 2016. ^ "Why The Polls Missed Bernie Sanders's Michigan Upset". FiveThirtyEight. March 9, 2016. Retrieved March 29, 2016. ^ "Bernie Sanders surprises Hillary Clinton in Michigan. Is Ohio next?". Los Angeles Times. March 9, 2016. Retrieved March 29, 2016. ^ "2016 Primary Forecasts: North Carolina Democratic primary". FiveThirtyEight. Retrieved March 29, 2016. ^ "2016 Primary Forecasts: Florida Democratic primary". FiveThirtyEight. Retrieved March 29, 2016. ^ "March 15 Primary Results 2016". The New York Times. March 22, 2016. Retrieved April 6, 2016. ^ "Bernie Sanders Says He Won't Seek Recount in Missouri". The New York Times. March 18, 2016. Retrieved March 28, 2016. ^ "Missouri Election Results 2016". The Washington Post. Retrieved March 28, 2016. ^ See the timeline in 2008 Democratic primaries. ^ Yoon, Robert (March 21, 2016). "Bernie Sanders wins Democrats Abroad primary". CNN. Retrieved March 28, 2016. ^ Bradner, Eric (March 23, 2016). "Primary election results: 5 takeaways from Western Tuesday". CNN. Retrieved March 28, 2016. ^ "Clinton cruises in Arizona, Sanders takes Utah and Idaho". Politico. Retrieved March 28, 2016. ^ "Hillary Clinton and Bernie Sanders square off in Arizona, Idaho, and Utah". Slate. Retrieved March 28, 2016. ^ "March 22 Primary Results 2016". The New York Times. March 29, 2016. Retrieved April 6, 2016. ^ "Can Sanders sweep Clinton in today's contests?". Politico. Retrieved March 28, 2016. ^ "Can Sanders sweep Clinton in today's contests?". Politico. Retrieved April 8, 2016. ^ "Bernie Sanders wins Alaska's, Washington state's Democratic caucuses". The Washington Times. Retrieved March 27, 2016. ^ "Bernie Sanders "Outperforming Obama" In Washington State". realclearpolitics.com. Retrieved April 8, 2016. ^ "NYC debate info". Democrats.org. Retrieved April 7, 2016. ^ "Wyoming Democrat". The Green Papers. Retrieved April 10, 2016. ^ Bloch, Matthew; Andrews, Wilson (April 20, 2016). "How Every New York City Neighborhood Voted in the Democratic Primary". The New York Times. Retrieved July 31, 2016. ^ "Donald Trump Hillary Clinton Win Big on Super Tuesday III". Fox News. April 27, 2016. Retrieved April 27, 2016. ^ Roberts, Yoon (May 7, 2016). "Hillary Clinton wins Guam Democratic caucuses". CNN. Retrieved May 7, 2016. ^ Gale, John A (May 10, 2016). "Election Results". Nebraska Secretary of State. Retrieved June 5, 2016. ^ Wyman, Tim (May 25, 2016). "Democratic primary results". Washington Secretary of State. Archived from the original on June 8, 2016. Retrieved June 5, 2016. ^ Murray, Mark (June 2, 2016). "Dem Race Tightens in California as Clinton Barely Leads Sanders 49% to 47%: Poll". NBC. Retrieved June 8, 2016. ^ Yen, Hope (June 5, 2016). "Clinton moves closer to nomination, sweeps in Virgin Islands". Associated Press. Retrieved June 5, 2016. ^ Coto, Dania; Lerer, Lisa (June 5, 2016). "Clinton wins Puerto Rico's primary". Associated Press. Retrieved June 5, 2016. ^ Oliphant, James (June 6, 2016). "Clinton clinches Democratic presidential nomination: AP and NBC". Reuters. Retrieved June 6, 2016. ^ Memoli, Michael A. "Hillary Clinton's immediate response to AP: Tuesday is the real clinching moment". Los Angeles Times. Retrieved June 7, 2016. ^ Dann, Carrie (June 6, 2016). "Sanders Blames Media's 'Rush to Judgment' as Clinton Hits Delegate Majority". NBC News. Retrieved June 7, 2016. ^ a b Healy, Patrick; Martin, Jonathan (June 7, 2016). "Hillary Clinton Wins California, Bolstering Claim to Nomination". The New York Times. Retrieved June 8, 2016. ^ "Bernie Sanders Will Fight One Last Primary But Pledges to Work With Hillary Clinton to Avert 'Disaster' of a President Trump". Retrieved June 10, 2016. ^ Gaudiano, Nicole (June 16, 2016). "Bernie Sanders says Democrats' top task is defeating Donald Trump". USA Today. Retrieved August 1, 2016. ^ Evans, Brad; Ledbetter, Stewart (July 13, 2016). "Sen. Bernie Sanders ends bid, endorses Hillary Clinton for president". WPTZ. Retrieved August 1, 2016. ^ a b c "Here are the latest, most damaging things in the DNC's leaked emails". The Washington Post. July 25, 2016. ^ "Debbie Wasserman Schultz to Resign D.N.C. Post". The New York Times. July 24, 2016. ^ "DNC CEO resigns in wake of email controversy". CNN. July 25, 2016. ^ Debenedetti, Gabriel (February 25, 2017). "Perez elected DNC chairman". "Politico". Retrieved March 2, 2018. ^ "Clinton fundraising leaves little for state parties". Politico. Retrieved November 9, 2018. ^ Seitz-Wald, Alex (November 3, 2017). "Memo Reveals Details of Hillary Clinton-DNC Deal". "NBC news". Retrieved March 2, 2018. ^ Vogel, Kenneth P.; Arnsdorf, Isaac (July 26, 2016). "DNC sought to hide details of Clinton funding deal". Politico. Retrieved February 21, 2019. ^ Lima, Cristiano (November 5, 2017). "Brazile: I found 'no evidence' Democratic primary was rigged". "Politico". Retrieved March 2, 2018. ^ Shane, Scott; Mazzetti, Mark (February 16, 2018). "Inside a 3-Year Russian Campaign to Influence U.S. Voters". The New York Times. ISSN 0362-4331. Retrieved May 16, 2018. ^ "Assessing Russian Activities and Intentions in Recent US Elections" (PDF). Office of the Director of National Intelligence. January 6, 2017. Retrieved May 16, 2017. ^ Entous, Adam; Nakashima, Ellen; Miller, Greg (December 9, 2016). "Secret CIA assessment says Russia was trying to help Trump win White House". The Washington Post. Retrieved July 11, 2018. ^ Collins, Michael (February 17, 2018). "Indictment: Russians also tried to help Bernie Sanders, Jill Stein presidential campaigns". USA Today. Retrieved July 11, 2018. ^ Kranish, Michael (April 12, 2019). "Inside the Russian effort to target Sanders supporters — and help elect Trump". The Washington Post. Retrieved April 16, 2019. ^ Roth, Andrew. "Russia denies DNC hack and says maybe someone 'forgot the password'". Washington Post. Retrieved July 12, 2018. ^ "Wikileaks founder Assange on hacked Podesta, DNC emails: 'Our source is not the Russian government'". Fox News. December 16, 2016. Retrieved July 12, 2018. ^ Ward, Alex (July 13, 2018). "Read: Mueller indictment against 12 Russian spies for DNC hack". Vox. Retrieved August 1, 2018. ^ Epstein, Reid J.; McGill, Brian; Rust, Max (April 27, 2016). "Republican Convention's Delegate Math Explained". The Wall Street Journal. Retrieved April 27, 2016. ^ Rivero, Daniel (July 26, 2016). "A day after calling for party unity, Bernie Sanders goes back to being an independent". Fusion TV. Retrieved July 31, 2016. ^ "2016 Presidential Race". OpenSecrets.org - Center for Responsive Politics. Retrieved February 26, 2016. ^ "Summary data for Hillary Clinton, 2016 Cycle". opensecrets.org. Retrieved May 25, 2016. ^ "Summary data for Bernie Sanders, 2016 Cycle". opensecrets.org. Retrieved May 25, 2016. ^ a b "Democratic National Committee, 2016 Democratic National Convention Delegate/Alternate Allocation" (PDF). Archived from the original (PDF) on June 24, 2016. Retrieved March 28, 2016. ^ a b c "Democratic Detailed Delegate Allocation – 2016". The Green Papers. Retrieved September 14, 2015. ^ "Iowa Caucus Results". The New York Times. Retrieved March 28, 2016. ^ "New Hampshire Democratic Primary Results". William M. Gardner New Hampshire Secretary of State. Retrieved April 1, 2016. ^ "Nevada Caucus Results". The New York Times. Retrieved May 15, 2016. ^ "South Carolina Democratic Primary Official Results". South Carolina State Election Commission. Retrieved April 1, 2016. ^ "Alabama Democratic Party certified Election Results" (PDF). Secretary of State of Alabama. Retrieved April 1, 2016. ^ Berg-Andersson, Richard E. "American Samoa Democratic Delegation 2016". The Green Papers. Retrieved March 30, 2016. ^ "Arkansas Official County results (provisional)". Arkansas Secretary of State. Retrieved April 1, 2016. ^ Berg-Andersson, Richard E. (April 15, 2016). "Colorado Democratic Delegation 2016". The Green Papers. Retrieved April 19, 2016. ^ "Georgia Primary Results". The New York Times. Retrieved March 28, 2016. ^ "Massachusetts Primary Results". The New York Times. Retrieved March 28, 2016. ^ "Massachusetts Democratic Delegation 2016". thegreenpapers.com. Retrieved June 13, 2016. ^ "Minnesota Caucus Results". The New York Times. Retrieved March 28, 2016. ^ "Oklahoma State Election Board - 2016 March PPP Election". ok.gov. Retrieved June 17, 2016. ^ "Oklahoma Primary Results". The New York Times. Retrieved March 28, 2016. ^ "Tennessee Primary Results". The New York Times. Retrieved March 28, 2016. ^ "Texas Primary Results". The New York Times. Retrieved March 28, 2016. ^ "Vermont Primary Results". The New York Times. Retrieved March 28, 2016. ^ "Virginia Primary Results". The New York Times. Retrieved March 28, 2016. ^ "Kansas Caucus Results". The New York Times. Retrieved March 28, 2016. ^ "Louisiana Primary Results". The New York Times. Retrieved March 28, 2016. ^ "Nebraska Caucus Results". The New York Times. Retrieved March 28, 2016. ^ "Maine Caucus Results". The New York Times. Retrieved March 28, 2016. ^ Berg-Andersson, Richard E. "Democrats Abroad Democratic Delegation 2016". The Green Papers. Retrieved March 30, 2016. ^ Johnson, Ruth. "2016 Michigan Election results". Michigan Department of State. Retrieved April 1, 2016. ^ "Mississippi Primary Results". Mississippi Secretary of State. Retrieved June 16, 2016. ^ Berg-Andersson, Richard E. "Northern Marianas Democratic Delegation 2016". The Green Papers. Retrieved March 30, 2016. ^ "2016 Presidential Preference Primary - Official Election Results". Florida Department of State Division of elections. Retrieved March 31, 2016. ^ "Ohio Primary Results". The New York Times. Retrieved March 28, 2016. ^ "Ohio Democratic Delegation 2016". thegreenpapers.com. Retrieved April 23, 2016. ^ "State of Arizona Official Canvass - 2016 Presidential Preference Election - March 22, 2016" (PDF). Arizona Secretary of State. April 4, 2016. Retrieved April 6, 2016. ^ Berg-Andersson, Richard E. "Arizona Democratic Delegation 2016". The Green Papers. Retrieved March 30, 2016. ^ "Alaska Caucus Results". The New York Times. Retrieved March 28, 2016. ^ "Alaska Democratic Delegation 2016". thegreenpapers.com. Retrieved April 23, 2016. ^ "Hawaii Caucus Results". The New York Times. Retrieved March 28, 2016. ^ "New York Primary Results". The New York Times. Retrieved April 17, 2016. ^ "New York Democratic Delegation 2016". thegreenpapers.com. Retrieved April 23, 2016. ^ "Connecticut Democratic Delegation 2016". thegreenpapers.com. Retrieved April 27, 2016. ^ "State of Delaware - Office of the State Election Commissioner". delaware.gov. Retrieved June 18, 2016. ^ "Delaware Primary Results". The New York Times. Retrieved April 26, 2016. ^ "Maryland Official Primary Results". Maryland State Board of Elections. Retrieved June 15, 2016. ^ "Maryland Democratic Delegation 2016". thegreenpapers.com. Retrieved April 27, 2016. ^ "Pennsylvania Democratic Delegation 2016". thegreenpapers.com. Retrieved April 27, 2016. ^ "Rhode Island Primary Results". The New York Times. Retrieved April 26, 2016. ^ "RI.gov: Election Results". ri.gov. Retrieved May 6, 2016. ^ "Indiana Democratic Delegation 2016 - Official Primary Results". thegreenpapers.com. Retrieved May 4, 2016. ^ "Guam Democratic Delegation". thegreenpapers.com. Retrieved May 7, 2016. ^ "Election Results". Nebraska Secretary of State . Retrieved May 10, 2016. ^ "West Virginia Democratic Delegation 2016". thegreenpapers.com. Retrieved May 12, 2016. ^ "Kentucky Democratic Delegation 2016". thegreenpapers.com. Retrieved May 17, 2016. ^ "Oregon Democratic Delegation 2016". thegreenpapers.com. Retrieved May 20, 2016. ^ "Presidential Primary Results". wa.gov. May 24, 2016. Retrieved May 28, 2016. ^ "2016 Presidential Primary". wa.gov. Retrieved May 12, 2016. ^ "Clinton moves closer to nomination, sweeps in Virgin Islands". Retrieved June 5, 2016. ^ "Delegate Tracker". Associated Press. June 6, 2016. Retrieved June 6, 2016. ^ "Virgin Islands Democratic Delegation 2016". thegreenpapers.com. Retrieved July 17, 2016. ^ "Puerto Rico Democratic Delegation 2016". thegreenpapers.com. Retrieved April 19, 2016. ^ "California Democratic Primary - Official Election Results" (PDF). ca.gov. Retrieved July 25, 2016. ^ "California Democratic Delegation 2016". thegreenpapers.com. Retrieved June 29, 2016. ^ "Montana Democratic Delegation 2016". thegreenpapers.com. Retrieved June 13, 2016. ^ "New Jersey Democratic Primary Results" (PDF). New Jersey State Elections. June 7, 2016. Retrieved June 15, 2016. ^ "New Jersey Democrat". The Green Papers. June 7, 2016. Retrieved June 7, 2016. ^ "New Mexico Democratic Delegation 2016". thegreenpapers.com. Retrieved June 13, 2016. ^ "North Dakota Democrat". The Green Papers. June 7, 2016. Retrieved June 7, 2016. ^ "South Dakota Democratic Delegation 2016". thegreenpapers.com. Retrieved June 13, 2016. ^ "Upcoming Elections: South Dakota Secretary of State, Shantel Krebs". sdsos.gov. Retrieved April 19, 2016. ^ "District of Columbia Democratic Delegation 2016". thegreenpapers.com. Retrieved June 14, 2016. ^ "2016 Election Center - Presidential Primaries and Caucuses". CNN. ^ "Delegate Tracker". Associated Press. Wikimedia Commons has media related to United States presidential Democratic Party campaigns, 2016.